Okay, I know its been a while since I’ve posted. But I have plenty of good excuses. We bought a pug puppy, who is a gorgeous, google-eyed, bundle of fat, named ‘Doug’. Its been five weeks since we picked him up but it still feels like a hurricane has come crashed our home. Even though there are four of us taking care of him, we’re all shattered. Having raised two children already, I swear that was easier because at least babies can wear nappies. Doug hasn’t made the connection yet that you can’t just pee or poo whenever the urge takes you. He covertly finds many dark corners to ‘leave us gifts’. Its a good thing he’s so unbelievably cute and squishy because that makes up for a lot. My freelance work has also been crazy busy. A massive onslaught of food styling and recipe writing has left me with zero time to write posts. So nuf said! This is one of my favorite stews from ‘Meals in heels’. Not only incredibly simple to make, it has bags of winter cosiness. Its sort of a riff on the classic veal marsala but there isn’t any pounding or unethical meat involved. Marsala is a fortified wine similar to sherry and Madeira, but much sweeter. Produced on a small island off the coast of Sicily, its raisin-like taste is brilliant with meats or stews. Boneless chicken thighs work better here than breasts. Their dark lovely meat stays juicy and tender while braising. Serve it with mashed potato or egg tagliatelle with butter for the perfect cold weather food. Season the chicken with salt and pepper and dust with flour. Heat half the oil in a large saucepan over medium heat. Cook the chicken, in batches, for 1–2 minutes each side or until browned. Remove and set aside. Add the remaining oil, shallot, garlic and rosemary to the pan, season with salt and pepper and cook for 5–6 minutes or until the shallot is softened. Add the mushrooms and cook for 5 minutes or until browned. Add the tomato paste, Marsala, stock and chicken, reduce the heat to low and simmer for 25 minutes or until the chicken is tender. Scatter over lots of parsley to serve. This is my new little friend! Oh, chicken marsala! I kind of forgot about this lovely classic. The photos are mouth-wateringly gorgeous. 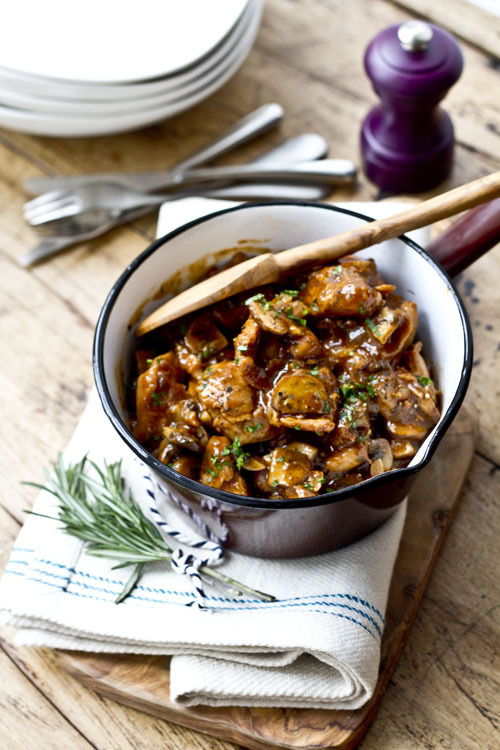 I love using big meaty portabella mushrooms in stew… I find they hold up better than the white buttons. Doug! What a cute little guy! That sounds incredibly delicious! Great photos! Your new little friend is so every adorable. Not forgetting the stew looks delicious and clicks are fab! 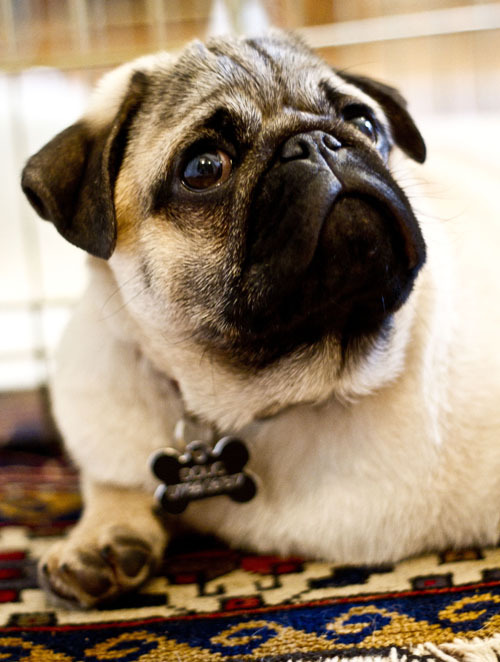 Looks perfect at my dinner table… What a cute pug you have there! What great picture and recipe! Yum! Can I make this in my socks? looks like great midwinter comfort food to me! Hi rosemary, glad you like the blog. The book is on amazon in the US and has American measurements! Just visited for the 1st time and will be back, but had to say how adorable your new little friend is. Made this tonight. I could spend all night eating those mushrooms. 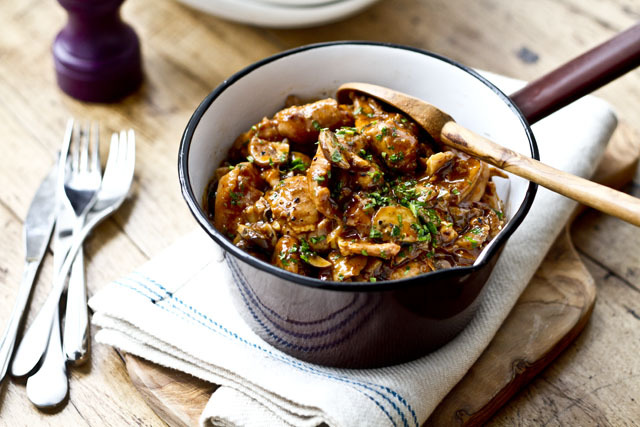 That chicken and mushroom stew is looking really good! Made this just before Christmas…a real winner, really delicious! Thanks that’s one of my favorites as well.